Roaming Dragon came to life as two lifelong friends identified a major void in Vancouver’s food scene…the absence of restaurant quality food being served via Food Trucks! 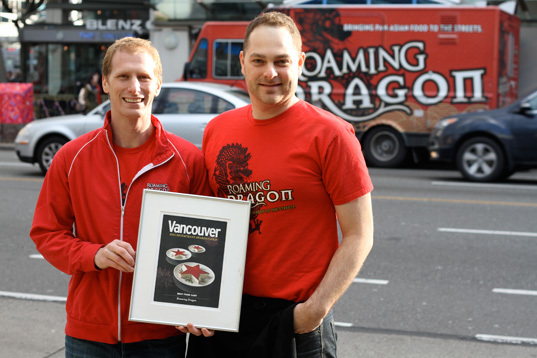 Since launching in June 2010, Roaming Dragon has earned praise for our menus, our involvement as leaders in Vancouver’s food truck revolution, and for elevating the food truck experience across Canada. Roaming Dragon can be seen on the streets of Vancouver, catering the city’s most exciting events, at a Farmers Market, or participating in charity events. We specialize in authentically unauthentic Pan-Asian deliciousness. We offer unique interpretations of dishes and flavours familiar throughout Southeast Asia. As crazy as it may sound, the Dragon is so much more than a truck that serves food…the Dragon has a spirit and energy of its own! From the aesthetics of the Dragon to the delicious smells, the music to the welcoming lanterns, the amazing food to our incredible staff…the Dragon has heart and soul. The combination of food, music, smells, and smiles from our team make the journey to the Dragon special. We’re PROUD of our team, PROUD of our food, PROUD of our suppliers, and most of all PROUD to serve our customers. We fundamentally believe that you DESERVE the finest ingredients, prepared with care and respect, and presented in unique and delicious ways. We’re PROUD to know where our food comes from, that it was raised ETHICALLY and NATURALLY. Our team takes PRIDE in bringing you the most INNOVATIVE Pan-Asian cuisine you’ll ever come across!